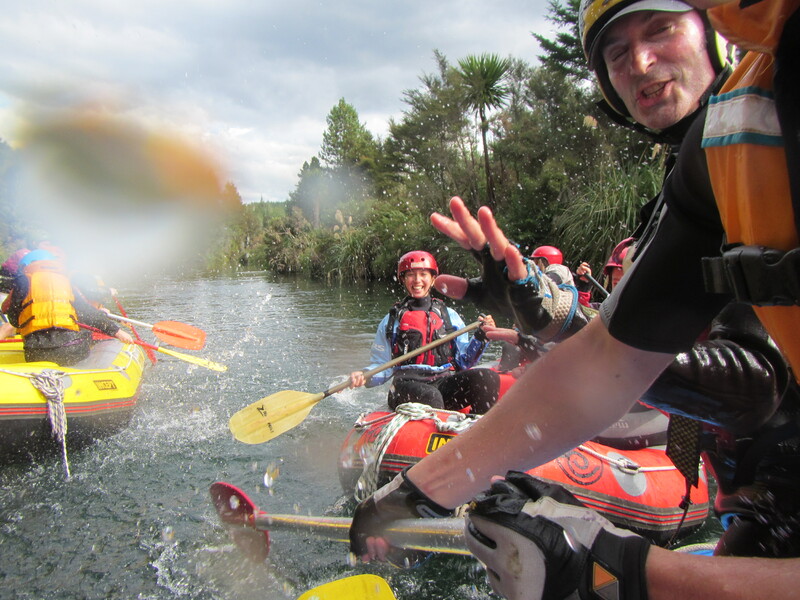 This weekend I went on my first trip with AUCC (Auckland University Canoe Club) and we spent the weekend camping and white water rafting Rangitaiki. The water was very low (and slow) because of the drought so there was not as much white water as I had hoped to see. It took us close to three hours to get down a quarter of the river before we had to call it quits because if not we would have been out until the middle of the night. I had fun but I was a little disappointed that the river was so slow. The water was also freezing and I was not prepared for ice cold water; I am very happy I did not fall in. During one rapid we were pushed into a large tree hanging over the river, luckily I ducked so I did not get hurt but in this tree was a very large spider nest that we had just upset. One by one I watched as spiders scattered around the boat and I had a mild panic attack. Killing each one I saw, my focus was no longer on the rapid we were going down and instead on the creepy crawlers that were everywhere. Towards the end of the run we ran into two rival boats who were engaged in a splashing war and I begged for us to go around them but everyone else wanted to get involved in the excitement so I was out ruled. I tried very hard to stay dry but there was no hope. Trying to avoid the war just made me a bigger target and soon I was drenched. Rangitaiki River is about an hour away from Rotorua and has grade 3-4 rapids. All of the instructors said this was the lowest they had ever seen the river and everyone was disappointed by the route. After rafting we went back to the campground and ate dinner. Again, I made a pound of pasta and I cringed during my first bite and then gave the rest away to friends who thought it was the best pasta ever. After dinner everyone in the club, all 60 of us, went to a local pub and completely took over the place. We all crowded into a bus and a camper van and somehow managed to fit. It was very fun getting to know more members and meet more students. I am not sure if I will be going on another Canoe Club trip this semester but it was fun for a one time experience. As much as I enjoy camping, it is just getting too cold to be sleeping outside on the floor! Your descriptive writing about your canoeing experiences makes me extremely jealous. In my head I vividly pictured us screaming and freaking out over getting soaked and potentially flipping the boat over. Needless to say, your reality is my fantasy and although that may sound sexual, it makes me envious of your journey. I miss you more and more each day. Keep posting blogs so I can pretend I’m there with you laughing over senseless things, while talking about our profound maturity. You look happy and beautiful, a combination many people lack and desire for. Love you always.